Three pieces of clinical finishing inside the opening 40 minutes on Tuesday evening sent Brakes to the top of the table for the first time this season, writes Paul Edwards. Visitors Slough were no mugs and certainly much better than their position in the table suggests, but while they fully played their part in an entertaining encounter they were unable to test Tony Breeden as much as they would have liked. Ben Mackey stung the palms of Rebels keeper Mark Scott with a powerful drive inside the opening couple of minutes and this was to serve as an early warning as they were ahead with just ten on the clock. The visiting bench were incensed at the absence of a flag as the ball was cleared downfield, but with Lee Chilton not among two players stood in an offside position he made full use of the confusion in the Slough defence to centre for an unmarked Jack Edwards to loop a header beyond Scott and into the net. The visitors almost levelled matters immediately. Scott Harris mis-hit his shot from the edge of the area after being played in by Adam Martin and the ball struck the inside of the post after seemingly rolling in slow motion towards goal, allowing the Brakes defence to clear. Slough’s main threat was coming from striker Lewis Putman, who drove one shot wide and saw another cleared away from the near post by Ben George as it became apparent that more than one goal would be required for Leamington to win this game. Fortunately, another duly arrived with 25 minutes played, and a superbly worked goal it was too. Chilton fizzed in an inch-perfect diagonal ball from the left over the head of a defender and into the path of Lee Moore on the right wing. He in turn teed up Mackey on the edge of the box to fire an unerring low drive into the bottom corner past the dive of Scott. The visitors were left scratching their heads as to how they were two goals down but had Scott to thank that it did not quickly become three, with the keeper darting off his line to deny the lively Chilton when the ball fell to him in space just inside the penalty area. The third goal did arrive in the 36th minute, however, Edwards powering home his second of the game with a thumping close-range header from George’s delivery following a short corner on the right. Warren Harris had a shot blocked as Slough applied some late first-half pressure in a bid to claw back the deficit and Breeden was called into action when he helped Putman’s well-struck free-kick over his crossbar. The Leamington skipper saved a low drive from Ryan Hope as the visitors continued where they had left off in the second half. The same player bent a free- kick just over the bar before Breeden beat away another effort from Putman. A neat turn and shot from Connor Gudger almost produced a fourth goal for Brakes, the ball whistling inches wide of the upright, while Richard Taundry played in Mackey, who got the better of Guy Hollis and Dan Hicks but was only able to send a weak shot towards goal. Taundry fired a 25-yard free-kick towards goal that rippled the side netting, while Hope’s long-range drive for the visitors was deflected behind for a corner. Chilton almost scored a memorable goal when he picked up a pass from Gudger on half-way and set off on a mazy run that ended when he lifted a shot just over the bar from the edge of the box. 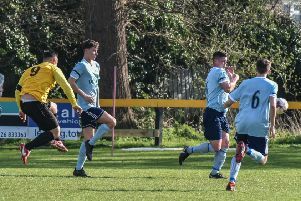 The industrious Putman worked space well for himself to get another shot away but was left frustrated again as the ball sailed well wide, and Brakes saw the remaining minutes out to move a point ahead of Chippenham at the Southern League Premier Division summit. BRAKES: Tony Breeden , Ben George, Connor Gudger, Joe Magunda, Jamie Hood, James Mace, Lee Moore, Richard Taundry (Ross Oulton, 77), Ben Mackey (Will Green, 77), Jack Edwards (James Fry, 87), Lee Chilton. Subs not used: Rob Ogleby, Eddie Caviezel-Cox. Slough Town: Mark Scott, Sean Fraser, Jai Dhillon, Guy Hollis, Dan Hicks, Adrian Sear , Ryan Hope, Adam Martin, Scott Harris, Lewis Putman, Warren Harris. Subs not used: Gary McDonald, Jake Parsons, Nathan Webb, Charlie Mpi, Luke Williams.